Chronically Vintage: You asked: Do you wear vintage clothing all the time? You asked: Do you wear vintage clothing all the time? If you sport vintage fashions out in public, you're bound to find yourself frequently being asked a number of the same kinds of questions. Hopefully, much as my own experiences have typically been, these questions will be friendly and not overly nosy (though you may find some a bit, how shall we say, off the wall, such as the ones I discussed last year in this post). In fact, you'll likely quickly discover that the same handful of queries pops up time and time again, one of the most frequent of which I receive is, "Do you dress like that (aka, wear vintage clothing) all the time?" I have on occasion also received this comment online, including from some of my lovely readers, one of whom (Jennifer from the blog thistlebear) asked just that on one of my vintage outfit posts (this one) a while back. The short answer - and the one I almost always give to those curious strangers who ask me such when I'm out and about - is, yes, I do wear vintage very nearly all the time (note that I put genuine vintage, vintage reproduction, vintage appropriate, and 1980s does 1940s and 1950s garments under, for the sake of simplicity, the banner heading of vintage; as well as, though I don't wear nearly as many of them rockabilly and gothabilly styles, too). That said, there is the odd occasion where I may want, or need, to don modern attire outside of the house. It doesn't happen often, and usually relates to medical appointments/hospital trips or taking Annie to the dog park, though every once in a blue moon, I will wear a wholly current look just because I'm in the mood to do so. I do not, by any stretch of the imagination, hate modern clothing (as I touched on recently in this post). Granted, I might not be a hurry to hop into neon skinny jeans or wedge sneakers anytime soon, but as a lover of fashion - not just vintage fashion - I certainly don't have anything against twenty-first century wardrobe offerings. They're just, typically, not the kind of styles that I feel the greatest amount of love for, nor any sort of magnetic pull towards wearing. For as far back in time as I have memories, I have loved anything relating to history, vintage (mid-century) clothing very much included. As a little girl, though I had no idea at the time that some people actually did so, I knew in my deepest heart of hearts that when I grew up, I wanted to wear the styles of the 1940s and 50s. The moment my folks started letting me buy my own clothing as a young teenager, I'd sprint down Main Street on my school lunch hour to hit the local thrift stores, where at the time, 1930s-50s garb was still readily available and often for what we'd now call today, mind blowingly inexpensive prices, too boot. From my first true vintage garment onward, I was hooked and have been ever since. Over time, my wardrobe has become a fabulous blend predominately vintage, repro and vintage appropriate pieces. I can go months, if not longer, between when I buy an item of clothing or an accessory that would be genuinely hard to style in a 1940s or 50s direction. I have a small assortment of such (modern) pieces, yes, but they see very little wear and are definitely the visible minority in my closet, stocked and stacked as it is with 1940s house dresses, 50s circle skirts, vintage babbles, repro denim, timeless cardigans, and myriad other old school or vintage inspired items. My wardrobe, much like the way that I dress, brings me an indescribable amount contentment and happiness. I feel more confident, less self-conscious, and a million times more like myself when I wear mid-century vintage fashions than when I do 99% of modern clothing. Many of these garments also fit my (short, curvy) body better than their present day counterparts. I adore the hunt involved with finding them, the memories attached to when they came to live with me, the knowledge that I'm preserving tangible pieces of the past through my wardrobe choices, the fact that I own a closet full of pieces that I'm guaranteed no one else in town has, and that I get to be time traveler, of sorts, every morning when I select my outfit for the day. Even, on those very rare occasions, when I do slip into something modern, it frequently has a vintage vibe to it, and even less common than me not wearing my beloved vintage attire, is for me to go without my usual mid-century style make-up and hairstyles. Vintage fashion is one of my greatest passions in life. It is an integral part of who I am, how I see myself, and how I present my appearance to the world. I don't wear vintage attire to intentionally standout from the crowd, though naturally, such cannot help but be the case (especially when you live in a small Canadian town that lacks a vintage scene). Instead I sport it so that I feel more like I fit in with myself, by which I mean, I am true to my inner sartorial desires and my unending passion for the past. I'm not saying you might never, ever, in a million years see me on the street in boot leg jeans, a modern blouse, and a pair of twenty-first century earrings, but if you do, there's a very good chance, I'll be thinking about, and missing, my usual old school garb the whole time. I get it. We should be ourselves and this, obviously, is you. Indulge! Aww, thank you very much, my darling friend. That means a lot to me to hear (and you know, I usually adore such posts myself, too). My vintage wardrobe didn't happen overnight either and it's current itation is actually, for the most part, not nearly that old, as I had to part ways with almost everything I owned at three (sort of four) times in my life, due to various difficult circumstances and also to international moves (with which I both went and returned home with just one suitcase and carry on bag worth of belongings to my name - save for the small number of childhood items stashed at my mom's house). That was, thankfully, several years ago now and I hope dearly that I never find myself in that spot again, as I love what my wardrobe has become these days. Not just it's size (which is nice, but by no means huge), but moreover the selection and diversity of what it houses and how currated I've made it. Clearly you took to vintage looks like a duck to water as well, when you did realize just how amazing they were for you, which is so awesome! You have an amazing, inspiring style and I always adore seeing what outfit you'll share with us next. Often times I forget myself when out and about and only realise I look different when I notice the stares and receive the comments. It's funny how an outfit as simple as a skirt and pretty top or a dress stands out amongst the jeans and leggings sported by the majority of women. I frequently get appreciative smiles from older men when out and about and then there are the 'costume' comments! I will wear modern items, I have a pinterest board chock full of modern pieces I know I can make work in a vintage styled outfit for future reference but I don't buy modern items that don't work in my preferred style. Even for hospital or doctor trips I wear the same items as I do day to day as I feel all wrong dressed otherwise! Oh my word, yes!!! And you know, I don't think it's necessarily just vintage gals who notice that point. On the rare occasions when we see a woman sporting the modern version of such, Tony almost always takes note and appreciates it, as do I. It's truly pleasant and refreshing to see someone up their style game a bit, especially around these small town parts where casual attire, especially on folks under the age of about 50, is beyond the daily norm. Thank you very much for your fantastic comment. I hope that you're having a really lovely first week of July and feeling a bit better than a few days ago, sweet gal. This was such an interesting read, Jessica. Thank you for answering my question (and for linking to my blog). I think you have a terrific sense of fashion and you always look beautiful in what you wear. You seem to have so much confidence in your appearance, it's really admirable. Thank you very much for your touching comment. There's a fascinating contradiction at work there though, because while I do have a fair amount of confidence in my attire, I've always massively struggled with self-confidence and body image issues, so I'm all the more grateful for the fact that I can derive a good deal of confidence from my vintage attire. I love your dedication to what feels like "you"! I remember vividly discovering that you could BUY vintage clothing (and not just raid mom's closet for things from the 50s and 60s) and feeling like someone got "me." I don't wear vintage every day, but I love finding real vintage up to the 80s and incorporating it into my style. Adore your blog -thank you! That's awesome, Shelia! My mom was born in 1958 and so by the time I came along in the 80s, her closet was just modern pieces and neither of my grandmas held onto their wardrobes - much as I wish they had - so I didn't get to experience the fun of raiding someone's closet for old pieces. I bet that was a very cool thing to do unto itself. Oh my word, yes! That feeling that someone else really got your style and was on board with dressing in the same kind of way was just such an amazing thing to have happen. For me, for all intents, I didn't feel that way until I got my first home computer (right around the end of 2003) and started finding some of the earliest vintage folks who made their presence known online. I was aware previously that I wasn't alone (and had encountered some rockabilly gals in bigger cities), but I hadn't yet found a group of like minded folks and it was just amazing to do so! Your style is truly marvelous, Sheila, and I can never get enough of seeing each new outfit that you share with us. If we ever get the chance to go shopping together, we simply must do so! Hi sweet gal, thank you very much for your comment and for sharing more about your style with me. Vintage purses and jewelry are the best!!! Even if my wardrobe were to incorporate more modern pieces, those two areas would still be massively vintage filled for me as well. Good question! Sweats, of which I only currently one pair of bottoms (and a few hoodies), do come out once in a while with the dog, but I usually wear my (one pair of) denim capris in the warmer months and either modern jeans or cords (both usually straight legged or boot cut - I beyond do not have the kind of legs needed to look good in skinny jeans) in the chiller months when out and about with her. Big hugs & oodles of happy weekend wishes! I get that question constantly and I'm so dang sick of it. I actually do hate all of the questions and attention and comments I get on the street. I just want to go on with life without thanking everyone for complimenting my ensemble or hair. Blogging is different of course because encouragement and compliments on my page are sometimes what I go by for future reference. I shutter at the thought of wearing something else modern (although my 1930s clothes are modern to me and are just every day clothes). I just get a horrible feeling in me when I think of jeans and a tee shirt. Ugh. Never. It's fascinating to me how some people enjoy such comments and questions, and others like yourself have long grown weary of them. I personally really enjoy them for the most part, assuming folks are friendly and kind, as the majority in this country tend to be. I appreciate that my look inspires people to want to strike up a conversation with me - as someone who is actually incredibly shy and introverted, it's been a good way over the years to help me gain more confidence in interacting with strangers, actually, though again as touched on in this post, I never dress the way that I do to be the center of attention. Yes, unless it was a very vintage (or rockabilly) spin on the classic jeans and tee look, it would not be something I'd reach for often myself either. That said, I do actually kind of love the look of wide legged 70s jeans and a band tee or something similar. The always stylish Janey from the blog Atomic Redhead has sported that kind of look before on her sight and always looks drop dead amazing in it. Thank you very much for your comment, honey. It's always a pleasure to hear from you. I hope that you have a fantastic weekend! My answer in such situation is usually: I wear what I am. These clothes are me through and through, they are my personal happy skin! Excellent answer, Sascha - I couldn't agree with you more! I feel wholly out of place in most modern styles and genuinely feel that vintage is me to my core. Have an awesome weekend, my dear! I definitely get asked if I am dressed up for a reason all the time, I always reply that no, I always dress like this! I totally agree with everything you have said in this post. I own a few pairs of jeans, some more modern tops from places like H&M, but you will only catch me wearing them on the laziest of days running an errand or when I know I'll be driving for hours and long-term comfort wins out. I think vintage styles are just so much more flattering to a woman's shape a lot of the time, and consequently feel better wearing my vintage styles as opposed to modern clothes! Oh my word, yes!!! Vintage styles are often so, so much more becoming on many women, especially those with curves - but of course it can rock on all body types, too, and more slender/athletic ladies often look drop dead amazing in 20s and 30s styles, most of which do not work in the slightest for curvaceous gals like myself. My mom and I were actually just talking about that yesterday (while at Value Village - natch! :)) and though she doesn't wear vintage styles herself, she has a very classic, elegant look and knows how to dress her (beautiful) body to a tee. She has always inspired me there (as has my paternal grandma, for which the same rings true) and I know that her encouragement and support of me dressing the way I do helped me so much to gain more confidence when it came to both my appearance in general and wearing vintage. Thank you for your fantastic comment, honey. I hope that you're having a wonderful 4th of July week! Thank you very much, darling gal. I'm so sorry that you get asked this question in a negative light. I would imagine that at least a few of the people who have asked me it over the years were coming from that direction, too, but my answer is so positive sounding that hopefully it helped to change their minds - as I'm sure yours did to the folks who asked you that as well. Isn't that a snarky, strange thing to ask someone! (Re: what happens if they see you not in vintage clothes.) Vintage is not a uniform, one is free to wear it - or not - as we please and it's no body's business how or from what time period you dress. I completely agree. Vintage gets into your blood and your soul and really stays with you. I do know some people (mostly bloggers) who started out vintage and moved into more hipster/modern/boho styles, but even with most of them, you still see elements of vintage coming through. I think that once you've had that amazing sartorial Pandora's box opened, there's just no going back entirely and that is such a beautiful, life changing thing. Huge thanks again & have a fabulous weekend! While I'm not out and about often enough to get a lot of comments, I have received some rather interesting questions at work. I think the weirdest thing that's ever happened, though, was when one of our regulars who used to dress vintage asked me if I was wearing a petticoat and then preceded to lift the edge of my dress to see if I was. Holy smokes, what a massive invasion of your personal space. I would feel so unnerved if that happened to me! I've had people touch my hats before, especially those with big feathers on them, but I've never had some do something that invasive with my wardrobe. I'm really sorry you experienced that, sweet gal, I'm sure it was incredibly uncomfortable in the moment. It certainly was awkward, had I not known the woman for a few years I probably would have been much more uncomfortable with the whole thing than I was and at least she didn't go beyond lifting it a few inches. :s It's very weird, but when I mention I've sewn my outfit people do tend to want to finger my clothes. Still, then, it's not like she was your grandma, it was so inappropriate! That says a lot though about the state of clothing these days. You say something is homemade/home sewn and they want to feel the quality, expecting, I would imagine, that it's better than most store bought offerings these days (which of course your garments would be!). Have a beautiful 4th of July, my dear friend! Oh my goodness, wow, that is - no word of a lie - one the nicest things anyone has ever said to me (or done regarding me). I'm incredibly honoured, thank you so much, Sharon. I swear, I will smiling from ear-to-ear and feeling all warm and fuzzy inside all weekend thinking about that. I'm a huge proponent of anyone who wants to wear vintage, regarding of age, size or any other factor, doing so and bet you would breathtaking in 40s and 50s fashion, lovely lady. Really and truly, thank you again. Have a stellar 4th of July weekend! Hi Sharon, you are beyond welcome. I can't begin to tell you how much it means to me to know that I've helped influence and inspire your style and fashion confidence levels. That is the best thing a vintage blogger like me could ever hear. I'm here to support you in your vintage journey entirely and always welcome any specific ideas you may have or if you just want to talk shop, so to speak, when it comes to wearing mid-century styles. That is marvelously sweet and so very touching of you to say, lovely Myriam. Thank you so much!!! Tons of hugs & happy 4th of July wishes! I did that the other day ~ I actually left the house in "modern" outfit. I looked like everyone else, and felt as jumpy as a cat on hot bricks. I was so uncomfortable in my own skin ~ I won't be doing that again anytime soon! Haha! Oh my word, yes! I swear, it makes me anxious/jumpy feeling, too - and like I'm in another person's skin. It's sooo weird! If I was out in, say, a goth or perhaps heavily boho or other strong niche fashion's offerings, not so much, but if we're talking straight up modern style, look like most everyone else, my skin pretty much crawls from feeling uncomfortable. It's good to know that I'm not the only vintage wearer who runs into this. You could be a runway model! I wear more vintage inspired clothes because of the work I do. However, when it comes to vintage costume jewelry it's another story...and it looks so pretty even when it's not being worn. :) Oh, and jewelry doesn't take up much space either so there's always room for more! Doesn't it though? I know some ladies who display a lot of their favourite brooches on pretty sofa cushions and it looks amazing. Vintage jewelry is art unto itself and always, always strikes a gorgeous picture wherever it's worn or displayed. Thank you so much - that is exceedingly kind of you to say. I don't think Milan will be calling anytime soon, but you never know - vintage fashion bloggers could catch on as the next mainstream type of model of the moment (doubtful though). Have a fabulous 4th of July weekend, lovely lady! i´m so used to the midcentury looks that by looking at your pics in this post i don´t think you wear something special - i see just a well and pretty dressed young women - beautiful young women to be correct!!!!! Very well said, my dear friend. I agree there there are certain, very select modern pieces that have their moment and deserve the spotlight, but in general, vintage looks are truly so much more becoming and beautiful most of the time. Neons can be a lot of fun! I really don't own much in that colour palette, but I've always had a soft spot for neon pink (stretching back to childhood) and have a tradition going back many years of painting my finger and/or toe nails neon pink each year for my birthday. It's just one of those things that came about organically and that I now look forward to as a fun little element to the act of getting another year older. Thank you very much for your wonderful comment. Have a joyful first weekend of July!!! Thank you very much for your great comment. I hope that you guys and all your darling pets have a fabulous 4th of July weekend! I totally understand you, it's not that you don't like skinny jeans or other pieces, but that this style - vintage, 40s, 50s - is the one you prefer! To tell you the truth, that's the one I prefer too, and 20s, 30s and even 1890, in fact. I wear a bit of all, but in my case that's what I feel comfortable with. I think you should wear what make you happy and comfortable with and I think this style suits you so perfectly, that if I saw you wearing jeans I would be a bit socked :) Not that jeans wouldn't suit you, but I am now used to see you with the beautiful vintage outfits that you show! Hope you have a very nice weekend, dear Jessica! Precisely, dear Denise, that is so the case (though skinny jeans look atrocious on me, so that's not something you'd be apt to see me wearing) and you summed things up wonderfully. Thank you! Have a sunny, fantastic weekend, too! Sempre linda e elegante, amo. Absolutely! That is such an integral element of wearing vintage for me. That act of looking to the past and a guiding light and finding endless inspiration in it for one's wardrobe choices is a substantial part of why I never grow tired or bored with wearing vintage. Thank you for raising that excellent point and for your lovely comment, dear Katie (and speaking of vintage styling inspiration, you always just that for me and sure oodles of other people, too). Fabulous post, I'd agree with you on this :) I never wear "modern", except sometimes a vintage styled outfit without a disticly vintage hairstyle is about as close as I'll get to being "modern" styled. 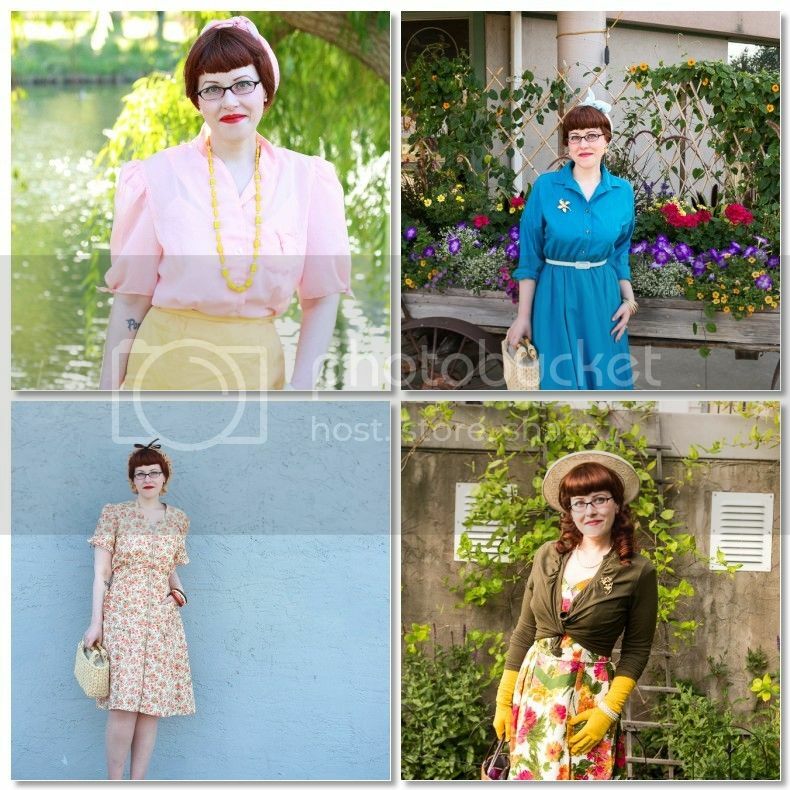 I do use modern pieces in my vintage styled outfits though because I don't own many actualy vintage pieces yet. Though as my mula increases hopefully my true vintage will increase also :) You're a lovely lady! Hi sweet Theresa, oh my too!!! I am the world's biggest proponent of creating a vintage look with whatever pieces help you get there - be they genuine vintage, repro, 80s does 40s/50s, or classic modern ones that have that great vintage appropriate look to them. Why not avail of everything that's out there for our fun vintage styling needs? Thank you for your great comment! Have a truly fantastic 4th of July weekend! This post is so timely! I read it after having been out with my husband to a USA Independence Day parade where two older women shouted at me on the street that my vintage appropriate red/white/blue polka dot sailor dress with hat, gloves and bag wasn't cool and I looked stupid. I think they were inebriated. I was stunned as I have never had such overt nasty comments before. I have heard negative comments muttered in my presence but never anything like this. Bystanders took them to task for being rude & mean. Then complimented me saying I looked smart. Have you ever had a similar experience? How would you respond? Thanks for your informative posts with the photos showing the details. It greatly helps with styling as I am a similar body type. My mantra is: How would Jessica style this? You always look great and am such an inspiration to someone new to vintage styles. I look forward to your posts. Have a wonderful birthday. Hello my lovely fellow vintage fan, thank you very much for your incredibly touching comment. Knowing that I inspire you to that degree is both moving and uplifting/encouraging at the same time. I'm truly sorry that you received such a mind-blowingly rude comment. Please, please, please, I implore you, brush it off and realize that they were the ones who looked dumb in what they were doing and saying. I'm sure you looked more beautiful than all of tonight's fireworks across the country combined and that those ladies were just, as you said, drunk. Pay them no heed, my dear, and keep wearing your amazing vintage styles with confidence and panache! For every "hater" out there, I promise you that there are scores of folks who enjoy seeing and are even inspired by the way that you dress. I've not run into that exact kind of blatant rudeness from a stranger, no, but in such a situation, unless they were confronting me face-to-face, I would have just ignored them or made a snappy general comeback such as "well, we know who started celebrating today nice and early!". Laughed and gone on with my day. Words can only hurt you if you let them - especially from intoxicated strangers. Three cheers for being a similar body type!!! I don't actually feel like I encounter too many people, online or off, in the vintage world with one like me - short and curvy, yet not plus sized, so it's always a real treat to connect with someone who can relate and who figure is much like my own. Again, my sweet dear, thank you so very much for your comment (and birthday wishes). I hope that this comment doesn't ruin your weekend and that you have a beautiful 4th of July celebration! That is an excellent - and not often discussed in our circle - topic at all. You don't have to go out of your way to "prove" your vintageness at all. One can love vintage like their first born child and yet not wear a lick of it for whatever reason(s). No body has the right to judge anyone's passions based on how much they outwardly present them to the world or not. Thank you so much for bringing that up, sweet dear - it's a topic worthy of a post unto itself. If they were neon pink, I could wear them tall boots and a long shirt...maybe :D I don't own any though. In fact, I don't currently have any modern jeans, save for my one pair of denim capris, and even those are quite 1950s looking. Thank you very much for your great comment. I truly love and admire your fashion sense and how long you've been into old school looks. You always find gorgeous dresses that work wonderfully on you and have a great eye for styling. Seeing your outfit snaps on Instagram is always a highlight there for me. Tons of hugs & happy wishes for the week ahead! It not only looks natural but also feels natural which I think clearly marks its your identity. I love a good vintage outfit and love seeing you in them. For me vintage is special, I love to wear vintage and to mix it up with current or classic items. Although I have done a few full vintage looks I adore. I love your style to no end! Currently I am not wearing vintage/rockabilly full time as I'd like to, had some set backs, and finances with what they are, it can be hard to build up a first timer's wardrobe. I don't understand the edge sneakers or neon skinny jeans, though I do like skinny jeans on my body even though I'm plus sized. But whenever I'm out and about I always search for clothing that at least as a vintage aesthetic so I can have a bit of vintage/rockabilly in my every day look. That's a great approach to take, especially since there are a fair number of vintage appropriate modern options, at all price points, that go a long ways in creating vintage/rockabilly looks, such a classic cardigans, plaid and gingham shirts, basic pencil and a-line skirts, and (when one can find them) high waisted trousers, plus jewelry like pearls, plastic bangles, and novelty brooches. I hope that some great, very budget friendly new finds come your way this summer, sweet gal. Thank you again for each and every one of your terrific blog comments today. You spoiled me with them!! !